NetherRealm releases are impressive beasts. On sites like this it always feels like fighting genre stalwarts Street Fighter and Tekken have the upper-hand, and it's true that they'll command most of the attention in the competitive scene. 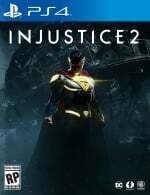 But still, games like Mortal Kombat X garner ridiculous traction among the mainstream, and looking at Injustice 2's metrics, it's going to be a strong seller. This trailer introduces Boy Wonder, as he goes to town on Batman with swords and Batarangs. We do enjoy the bounciness of the Mortal Kombat fighting system, and it looks as bone-crunching as ever in this clip. Which superhero will you be siding with come launch day in May?